Home NORTH COUNTY 5.0 Back Page The Demise of the Handshake? The Demise of the Handshake? Is the handshake being replaced by the high five, fist bump, finger pointing, or a hug? When is it OK to initiate each gesture of welcome, or do we just react to others’ lead? Do we stand there and shrug? Or reach out to others? What if the two of you just stand there waiting for the other to act? How long do you wait before doing something? Do you try to make an impact or react? Is it a male/female thing? Or a male/male thing? Or a female/female thing? Is it different in the winter with heavy clothing, or when we are more casual in the spring? Is it a West Coast thing? Is it a business setting or casual setting that rules the actions? Does venue matter? Does being on the basketball court, at church, or in the boardroom matter? What if it’s a family reunion, good friends coming for dinner, or seeing your neighbor on the sidewalk? Does age matter? Teens to do one thing, 20-somethings to do another and baby boomers another? What happens when the age group is 15-70 years old with grandparents, parents, or other family? Is the way to greet based on just hierarchy or on who is more aggressive or nervous? Is how long we have known the other person a major factor in type of greeting? Does status or position matter? CEO, manager or front-line employees need to know how to greet others. Should the person in a higher position of authority or age be the first one to extend a hand of hello? But how do you know unless they have a signature tee shirt saying, “I am a hugger”? When doing the fist-bump with little kids, is it necessary to do the fingers extended explosion at the end? Maybe it depends on the latest trend, and if there will be a smile as a dividend. How about pointing or giving thumbs up? There must be rules, but where are they? The “hand hug” occurs when shaking the right hand and grasping the wrist with the left hand. Typically, the hand hug is done by politicians or those wanting to greet warmly with a special touch. Or one can do the shoulder slap with the left hand to show friendliness. How proper is just the head nod and saying “hey” while walking by? Do you verbally greet others before the handshake, during the handshake or after? How about the high five? Is that just for sports or can you give it to a salesperson closing a big deal? Or the pastor giving a good sermon? Is it OK to show our approval with heart-felt zeal? Is the clinched fist to show unity, indicate victory or display success, a good display? But does it show a bit of “in your face” attitude about the accomplishment? Is it a fast gesture, like Tiger Woods sinking a winning putt, or do you pump it real slow? We further complicate this with the open-palm hand slap and the many gyrations that follow. Who knows all the moves with the wrist, elbow, or all that we can invent? Can you imagine the potential complications with sexual harassment or misjudged unprofessionalism in a business environment if the proper protocol is not followed? Where do your hands go, how tight do you hug and how long do you hold it? In business, the handshake should be dry, firm and two pumps, but that also gets complicated. Firm handshakes can be different if you are a 200-pound weight lifter or a 100-pound couch potato with rings on your fingers. Handshake pumps can vary from quick to verrrrrrry slow. But shake with the elbow, not the whole arm. We have seen some display of the hand pointing upward and slapping left to right. What is that? Do your activities prior to the encounter matter? Coming from the gym should dictate just saying hi, not a smelly hug. If the other person has an injured hand or arm, or they are carrying something, should we just nod, or shake the other hand? How about how you are dressed? Does formal attire mean formal greeting and just a handshake? Who initiates the contact? What if the female only presents her outstretched hand? Do you just grasp only a few digits of the hand? What if that was the Queen of England? What about personal space? How close do you get to the other person? What if their personal space is bigger than yours? What role does culture play in greeting decisions? Boy Scouts shake with their left hand. Those engaged in fencing also shake with their left hand due to the sword in their right. Secret societies may have a special handshake. Be prepared if they shake both hands? Some societies also hit the heart with their palm after the shake to show their connection. Other societies require that there be no contact between sexes or in certain environments. Let’s not even discuss the political side of bowing versus the handshake for foreign politicians. How about eye contact before, during and after the handshake? Does that matter? Should all of this be taught in schools? Should we mandate a class for appropriate greeting etiquette? Or do we learn as we experience all the above and develop a mental checklist? Should we just ask the other person how they would like to be greeted before the meeting? Should we bring back the handshake as the only way to greet someone else? Or is it a fading part of the past as we utilize our vast repertoire of greetings? 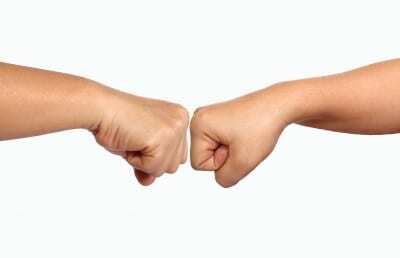 With a focus on health, should we discourage the handshake altogether, since it may spread colds and flu? How do you not greet your fellow combat vet with more than a handshake? How do you show mutual respect and honor? We must hug our parents, siblings or our kids. How far does that extend? As for me, I am a hugger, except in a formal business setting. But that can be problematic when you hug some people and just shake the hand of others. What message are you sending? The handshake is very important in job interviews and other situations where making an impression is important. Even then, it is based on how well I know the other person. I have stopped worrying about it and just do it. What if we had a hierarchy of greetings with a number to signal to the other person what is expected? Just raise two fingers when you first make eye contact and they know you are a hugger. If they immediately put up one finger or extend their hand, you know they are just fine with the handshake. 1-Handshake and verbal greeting is always OK.
2-Hug, when it feels right. 3-Chest bump for veterans and athletes. 4-High five for celebrating accomplishments. 5-Fist bump for teammates and encouragements. 6-Hand slap when in a hurry. 7-Doing what is appropriate for cultural greetings. 8-As for me and my house, we are huggers! OK your call! What is your plan for your next greeting? Have I made you nervous? My recommendation is to just shake their hand; It will be acceptable, or you will soon know.